Maintaining healthy hair starts with good practices in your daily hair care routines. Here are 7 easy things that can make a huge difference to your hair and scalp! Nothing beats a hot shower after a long day at work, but hot water can cause your hair and scalp to dry out. Cool (unheated) water works best, or at least go easier on the hot water! Yes we know, it is extremely satisfying to scratch the itches all over your head that has bothered you all day while you shampoo your head. You might even argue that your head is cleaner when you do so. But scratching your scalp with your nails is a definite no-no as it will damage your hair and scalp. Instead, use your fingertips and palms as much as possible. If the itching is really bad, you might be using the wrong shampoo or even have some form of scalp condition. 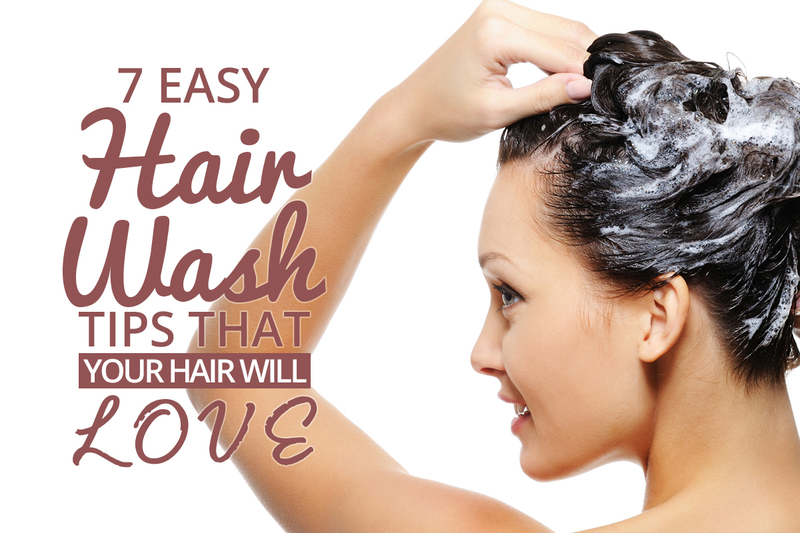 Since you’re already massaging the shampoo into your hair, you might as well enjoy it! Giving yourself a head massage while you shampoo not only ensures that your hair and scalp are thoroughly cleaned, but also enhances blood circulation on your scalp which contributes to healthy hair and helps you to relax. The build-up of excessive residue left by shampoos and other hair products is one of the common causes of hair problems such as dandruff and hair loss. That is why it is very important to take the time to rinse out shampoo and conditioners, otherwise it will do more harm than good in the long run. Using good hair products that do not have excessive or harmful chemicals helps tremendously too! This is a common mistake that must be avoided! Hair conditioner is meant for the hair, and should be applied around the middle length of your hair and down to the tips. In fact, the same applies to most hair products, including hair gels and hair spray. This prevents the scalp from getting clogged up from residues as mentioned above. It is not so much the drying of hair that is as important as drying the scalp. Neglecting to dry your scalp properly will result in your scalp being moist and warm – a hotbed for bacterial and fungal infections.For the ladies, make sure to lift your hair and blow dry the scalp (taking care not to burn it of course). It is fine to let hair ends air dry after gently towelling it.Men – yes your hair is shorter and might air dry easily, but a little diligence in towelling it dry can save you a lot of itchiness. Lastly, it may be faster to scrunch up your hair or rub your head vigorously with the towel, but it can also damage your hair in the process and cause more split ends. We suggest that you use a soft towel (micro-fibre towels work wonders) and blot or gently squeeze hair dry instead. As long as the hair ends are not soaking wet, it is actually better for the hair to air dry after.